Women's Western Belts For Sale On eBay! Below are women's Western belts for sale on eBay. There is usually an excellent selection in all price ranges. Please scroll down the page for a brief article on good things to know before buying a Western belt. Is the belt new or used? How long is the belt? Is the seller basing the length of the belt from a stamp or tag on the belt, or did they measure it themselves? If the seller measured the length of the belt themselves, how did they do it: Did they measure from tip to tip, including the buckle (if any), or did they measure only the leather without including any buckles? How wide is the belt? Is the buckle removable so you can change buckles? Do you care? What is the belt made of? 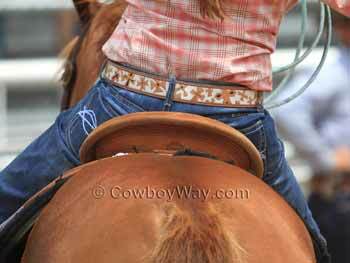 When many of us think of a "Western" belt we think of a belt made of leather. However, this isn't always the case. Make sure you know what the belt is made of so you don't get any surprises later on. What payment methods does the seller accept? How soon after the sale do you have to pay for your purchase? An increasing number of eBay sellers are getting tired of buyers who take a long time to pay for their item. Some of these sellers are now requiring the item be paid for within a certain time frame or the sale is off. Read the item's description for acceptable payment methods, times, and other terms (if any). Will the seller ship to your area? How soon will the belt be shipped after you pay for it? Does the seller accept returns? Every eBay item for sale has a "Seller info" area. Be sure to check this area to view the feedback that previous buyers have left for that particular seller. 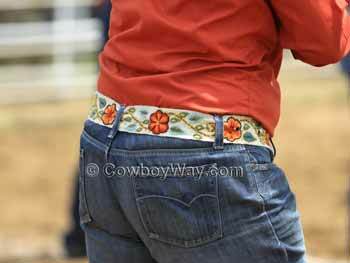 If you have any questions about a women's Western belt be sure to ask the seller before you bid or buy. Look for the "Ask a question" link in the "Questions and answers about this item" area to ask your questions. A simple, very pretty Western belt. A woven Western belt with floral embroidery. 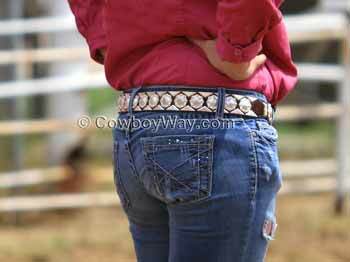 A hair-on-hide Western belt with lots of silver conchos and accents.